﻿Galway based smoking cessation hypnosis service. Are you one of the people who have tried everything bar hypnotherapy to stop smoking? Patches, gums, prescription drugs, e cigarettes, cold turkey, the lot? If so, you are one of many clients who eventually seek out hypnosis for smoking cessation. Physical replacement methods such as gums, patches, tablets and e cigarettes do work for some people, but not for everyone. Smoking addiction is a complex affair which involves deeply ingrained habits, beliefs and attached emotions. If you address smoking simply as a chemical dependency, you are not addressing those deep issues. If you address them, and uproot them, as you can do very effectively with hypnosis, you are suddenly in a different league among those on the quitting journey. No, hypnotherapy is not magic. No, hypnotherapy does not have a 100 percent success rate with smoking cessation. Hypnotherapy cannot be done “to” you. You have to actively participate in the process. However, what hypnotherapy can do is smoothe the journey for you. When you are fully committed to giving up cigarettes, it will give your subconscious mind a good old nudge and push you over the threshold into a new terrain. Once there you will find that your old ingrained habits and emotions associated with smoking suddenly are not as powerful as they once were. They may even be gone altogether. This study compared different methods to stop smoking, such as those mentioned above, across a large sample group of 72,000 people. The study found hypnotherapy to be the most efficient method by far for those attempting to stop smoking. Read the full article here. Study of 71 smokers showed that after a two-year follow up, patients who used hypnosis to stop smoking were twice as likely to remain smoke- free than those who stopped smoking using willpower alone. 87% Reported Abstinence from Tobacco Use With Hypnosis A field study of 93 male and 93 female CMHC outpatients examined the facilitation of smoking cessation by combining hypnosis and aversion treatments. At a 3-month follow up, 86% of the men and 87% of the women reported continued abstinence from smoking. Smoking affects bone density. Research has show that every ten years of tobacco use reduce the density of your bones by 2-3 percent. Smoking affects your circulation negatively. You might notice that you frequently have cold hands or feet, but that is just a small external sign. The real effects of poor circulation go much deeper. Smoke and increase your risk of heart disease four fold. Once a smoker develops heart disease, they will be twice as likely to die from a heart attack compared to non-smokers. Every second smoker who continues the habit, will eventually die from smoking related disease. Smoking ages your lungs prematurely. You know that feeling of being out of breath after only half a flight of stairs? Smoking does that. You may be suffering from skin conditions such as proriasis, and if so, you have a much better chance of those healing up if you stop smoking. Continuing to smoke will take 10 to 15 years off your life expectancy. Ever had a wound that was slow to heal? Stop smoking and improve your immune systems ability to heal cuts and wounds. Smoking negatively affects your fertility. Give up cigarettes and improve your sperm count, your chances of conceiving, and/or holding on to a pregnancy and having a healthy full term baby. Smoking affects your brain, too. People who continue to smoke as they age, have a much increased risk of developing Alzheimers. Smokers double their risk of macular degeneration which leads to blindness. Stop smoking and enjoy healthy white teeth compared to stained teeth suffering from poor blood supply. Stop smoking and look better. Smoking makes you age faster than you normally would by limiting blood supply to the small arteries and veins in your face. Cigarette smoking has been shown to be a leading cause for house fires. Stop smoking and stay safe. You CAN stop, and once you do, your body will recover quickly from the ordeal it has been through. Within a few days of stopping you will notice that you can breathe more easily and taste and smell your food once more. ​Your body will thank you. How do you know if hypnosis is the right method for you? The simple answer is this. 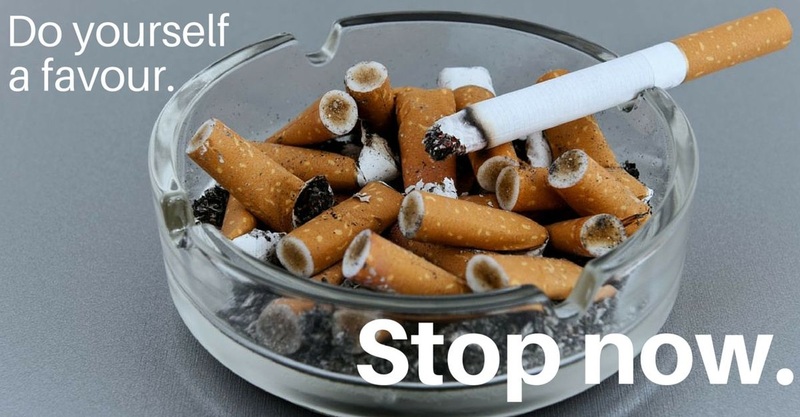 If you want to stop smoking, hypnotherapy can help you. If you are unsure or don't really want to stop, nobody can make you stop, including a hypnotist. I cannot make anybody do anything they don't want to do. What to expect from your hypnosis session? The Stop Smoking session with me is 2 hours in length. This ensures that I can get clients deep enough into a trance state to affect lasting change in the subconscious mind. A substantial session length also means I can adjust the session to each clients individual needs. Once you arrive I will have a chat with you about your particular situation and your personal requirements. I will talk you through what hypnosis really is, what it can and cannot do. I will then get you to do a couple of small exercises with me which prepare you for the actual hypnosis session. Then it will finally be time for your session. To get the best out of the session, I recommend you let go and relax as much as possible. Letting your mind drift is helpful. I also recommend really allowing yourself to get into the spirit and embracing all the positive messaging coming your way. You will leave the session as a non-smoker. At the end of your session you will receive a booster hypnosis session as a digital download which I will ask you to use daily for three months. This ongoing support will help you stay a non-smoker. Some people hesitate when they consider the price of a hypnotherapy session. Yes, it is a professional fee. And for that, you get the attention of a professional for 2.5 hours. Think about your health, the quality life time you can gain by quitting. Think about your loved ones who want to have you around for a long time to come. And also think about the savings: 20 cigarettes a day in Ireland in 2016 will set you back 10.50 Euros per day, or 319 Euros a month. You pay less than that for your Galway based hypnotherapy to stop smoking! Tick here if you are. Contact Brainwave Hypnotherapy at 086 3920466.